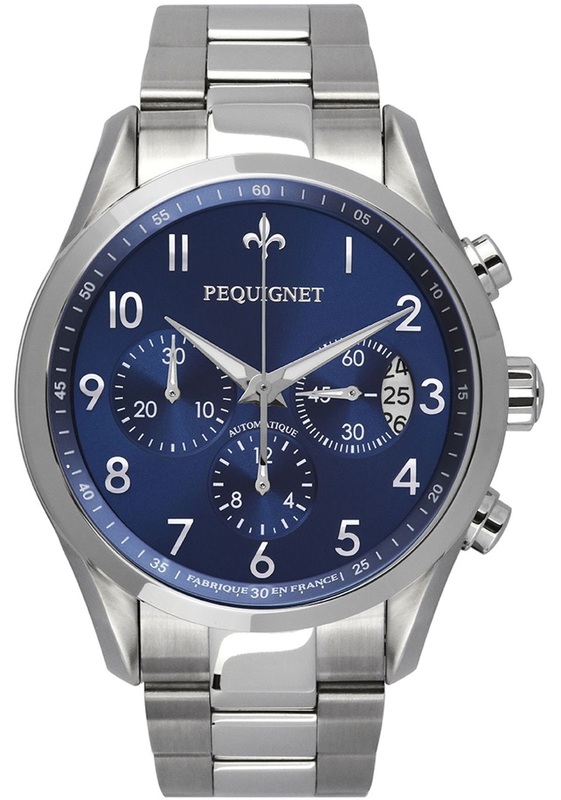 Pequignet recently presented its first chronograph from the “Elegance” collection, comprising men’s auto-wind models in a characteristic style of streamlined, elegant and now sporty watches. Resolutely masculine, the watch combines a very classic design with infallible functionality. Governed by an automatic mechanism involving a column-wheel module and vertical coupling, it provides precision mechanics and unrivalled comfort. The simplicity of its sunray dial catches the eye. The Arabic indices provide maximum readability next to a collar with the Maison’s logo and markings. The Fleur-de-Lys at 12 o’clock evokes the French manufacture of this model. The chronograph’s 12-hour and 30-minute counters respectively at 6 and 9 o’clock and the small second counter at 3 o’clock balance the dial wonderfully. This new chronograph is available with different dials (rhodium-plated, black or blue) and straps (steel bracelet or calfskin leather) offering several combinations for elegant and sporty men.